Like all the trainers at the Sorisa Sports Club in Denizli, Turkey, Ferit Osmanli takes shifts answering the phones. He fields same-old questions from customers about business hours, membership benefits, and class schedules. He deals with his fair share of wrong numbers. One could forgive Osmanli, a four-time world champion arm wrestler, a man with 17-inch forearms that might as well be made of granite, for pawning off these duties — nobody expects Tiger Woods to mow the fairways at Congressional — but arm wrestling, even at the highest level, can be a humbling endeavor. Only a handful of arm wrestlers earn enough to support their families. Engin Terzi, the lone arm wrestler to win world titles in five different weight classes, is one of them. Terzi, who lives in Turkey, told me that the wrestlers who compete full time receive compensation for victories from their home countries. Athletes from Russia, Ukraine, and Turkey can earn more from winning a single amateur European or world championship than American and Canadian athletes make from winning fifteen to twenty professional tournaments a year. John Brzenk, aka The Perfect Storm, the man generally considered the greatest arm wrestler in history, doubles as an airline mechanic for Delta in Utah. When Brzenk burst into the sport in the 1980s, arm wrestling was largely an American sport, but Brzenk took part in the Moscow tournaments of the early 90s that catapulted organized arm wrestling into the Russian-speaking world, where it found a rapacious audience of wily young men, among them a broad-shouldered kid named Ferit Osmanli. In those years Osmanli was living in far eastern Uzbekistan, the central Asian country where his family had been resettled during Joseph Stalin’s savage removal of Ahiska Turks from the republic of Georgia during World War II. Osmanli, who went by the Russian name Farid Usmanov back then, entered his first tournament in the eighth grade, his competition were all high schoolers, his prize for whooping them was a towel. Following high school graduation, under the tutelage of an experienced Uzbek arm wrestler who saw untapped talent in Osmanli, he began training three days a week. Six months later, in the Uzbek capital of Tashkent, the 19-year-old Osmanli won his first national championship, smashing his competition in the 220-pound classification with his right arm (and coming in second with his left). Shortly thereafter the president of Uzbekistan signed into law a statute offering financial prizes of $3,000, $5,000, and $10,000 to athletes who brought home bronze, silver, or gold from their sport’s world championships. The Uzbek economy was sputtering. Osmanli’s family, even with the income from his father’s law practice, needed the money, so in 2003 the old man paid for his son to make the trip to Moscow to compete in the now-defunct World Armwrestling Association’s championship event. It was Osmanli’s first major tournament. He finished second in his classification, but perhaps more importantly he got the chance to train with big dogs from Russia. They taught him a technique called the top roll, helped him perfect another move called the hook. Back at home, while continuing to study to become a physical education teacher, Osmanli began renting space from a local school to open a small gym. Because he had more friends than money, he called on local blacksmiths to help him make iron bars and pulleys for training. It wasn’t long before the gym began churning out junior and senior national champions. With the backing of a local cotton company, his first corporate sponsor, Osmanli traveled to South Africa to compete in the 2004 championship put on by the WAF. Osmanli returned to Uzbekistan with a silver and bronze medal. He expected an $8,000 payout from his surrogate country, but officials claimed the 2004 Summer Olympics in Athens had drained the coffers. Kanai struck fast, yanking Osmanli’s hand to within inches of the pad. But the 27-year-old’s arm wouldn’t cave. Osmanli fought back, and won. In the second match, he took cues from Kanai and pressed hard from the get-go. In front of the home crowd, he smashed Kanai’s hand into the pad. A displaced Turkish youngster from Uzbekistan was now an arm wrestling world champion with his right hand; at the same tournament, he defeated Andrey Pushkar, a young Ukranian fighter, to take gold with his left as well. The Uzbek government now owed Osmanli $20,000 for his gold medals. The money never came. More success followed. Osmanli beat American Ron Beck in Las Vegas. In Poland in 2006, he won the Professional Armwrestling League’s heavyweight world championship, a tournament that Engin Terzi says is one of the toughest because it brings together the best amateur and professional wrestlers. In the WAF world championships, held in Bulgaria in 2007, Osmanli topped Pushkar with his left hand yet again to claim the super heavyweight title. The unfulfilled financial promises began to tug at Osmanli. With four world titles to his name, not to mention numerous second and third-place finishes, he was becoming convinced that Uzbekistan had no plans to compensate him. Bringing a lawsuit against the Uzbek government, Osmanli says, would have been futile; no lawyers would have taken the case. The broken promises, like air blown through embers, reignited in the Osmanli family the hurts of the past, the pain of deracination, as well as a longing to find the place where they belonged. They started exploring options. Osmanli’s father learned that Turkey was offering an expedited path to citizenship for displaced Ahiska Turks. Like Uzbekistan, Turkey vowed to reward its athletes. Unlike Uzbekistan, it had a record of coming through. In 2008, Osmanli and his extended family relocated to Honaz, a small town in the Denizli province of southwestern Turkey, population 10,000, a place known for its native cherries and the inactive volcano for which it is named. Honaz also boasts dozens of Ahiska Turk families, people with eerily similar backstories and tales of survival. Moving to Honaz, to a place they’d never lived before, has proven to be a strange kind of homecoming. Although Osmanli has left the country where he learned arm wrestling, he has not dropped the sport. 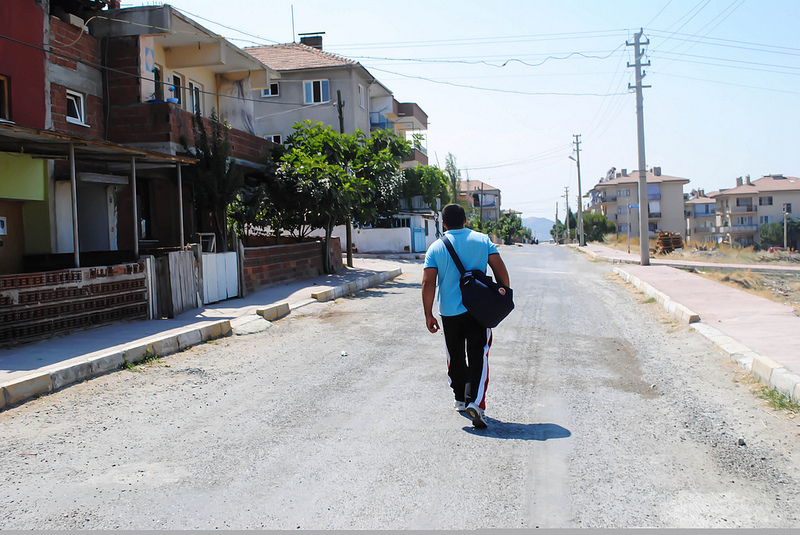 Often dressed in his favorite black Nike pants, the ones with the red and white stripe, he strides a quarter of a mile from his family home to the bus stop each morning, boards a minibus whose route passes over the ruins of the ancient city of Colossae. At the top of the hill, the bus races a stream through a crop-filled valley on its way into downtown Denizli. There, at the Sorisa Sports Club, when he isn’t manning the front desk, Osmanli curls more than 135 pounds with his wrists. He dabbles in judo to stay in shape. He trains kids and adults. His youngest pupil, a boy named Selim, is 13 years old. Selim’s father, who runs a local meat production company, sponsors Osmanli, giving him more than twenty pounds of red meat each week. It has been five years since Osmanli has won a world championship. He is 31 now. The move and the naturalization process (to obtain citizenship he had to stay in Turkey for two years) were necessary distractions. He has recently been plagued by an elbow injury. During his hiatus, Andrey Pushkar, his rival from Ukraine, became more dominant. Osmanli has fallen to him in the past two European and world championship tournaments. This past spring, at the European meet in Poland, Osmanli entered a different weight classification to avoid Pushkar, but gold nevertheless eluded him. He won the silver with his right hand, the bronze with his left. He will receive a sizable check from the Turkish government for the silver, his highest finish, but not as sizable as he would have received for gold. Andy Owens’s last piece for EthnoTraveler was about a hole-in-the-wall restaurant in Istanbul.